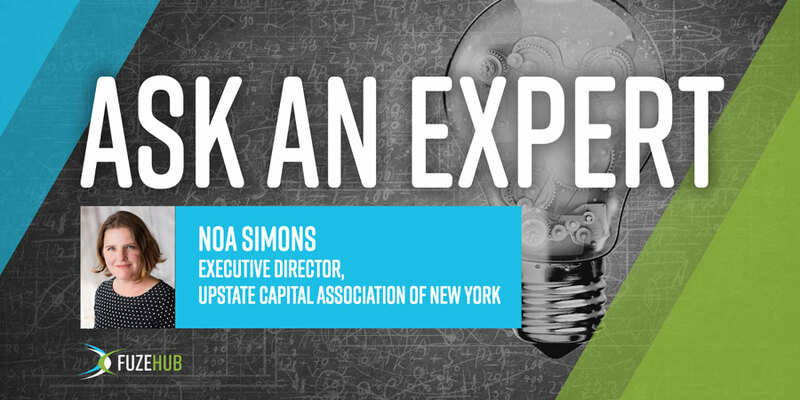 For this edition of “Ask an Expert” we spoke with Noa Simons, Executive Director of Upstate Capital Association of New York, a non-profit that serves as a hub for connecting investors, lenders, professional advisors and companies seeking capital across upstate New York. In her role, Simons manages a robust membership network and convenes events on technology, trends and best practices for deal-making for a wide-ranging audience including investors, entrepreneurs, service providers and professional advisors. • Prior to joining Upstate Capital, Simons was a partner at TD Growth Capital based in Shanghai, China. Her investment work included worldwide technology sourcing, market analysis and diligence on deals both inside and outside of China. Before joining that firm, she was interim CEO at Norton Motorcycles in Portland, Oregon and built and launched the digital archive housed at the Mary Ferrell Foundation. Tell us about your background and how you got involved with Upstate Capital? After launching the Hudson Valley Startup Fund and working in venture capital internationally for over a decade, I got involved with Upstate Capital (then known as UVANY) because I wanted to develop a deeper understanding of the New York investment landscape – the players, the industries, the inner workings of venture capital and private equity in the upstate NY region. I grew up in Columbia County and spent my summers outside Syracuse with my extended family, so I have deeply personal ties to the region. Running Upstate Capital has been the way for me to combine my passion for innovation, investing and business with upstate New York! What surprised me, after joining in mid-2016, was learning about the relatively new field of entrepreneurial ecosystem building. I’d read Brad Feld’s book Startup Communities, but had not fully understood the role of Upstate Capital as an ecosystem builder for the upstate NY region. Attending the 2017 Kauffman ESHIP conference in Kansas City totally changed my perspective on the role that Upstate Capital regularly plays in convening investors, innovators and stakeholders. What are some of Upstate Capital’s key initiatives that foster connections between investors and companies? Primarily, the organization hosts events across New York throughout the year. We produce events on topics of interest like women in technology and finance, and the dynamics of working with venture and private equity. We also produce events on sectors of interest, like agtech and food, and gaming. This year, we’re doing programs on investor connections for med-tech and cleantech startups. Our membership directory is another way that investors and companies make connections virtually – membership is required and is open to anyone who wants to join. Finally, this spring we’re launching a newsletter for accredited investors to share the deals they’re investing in, building connectivity for co-investment, syndication and follow-on investments for the companies that are getting launched in New York. Tell us about the typical company with which you work. The general rule is that the leader/owner/executive in the business needs to be thinking about strategic growth and change for their business. Other than that, companies we work with range from an idea on a napkin to $100 million-plus manufacturing companies. How would you describe the current landscape of entrepreneurship in New York State? The entrepreneurial ecosystem across New York is fragmented, but it is expanding and evolving quickly. While we have a few sources of capital and mentorship around the state, most are locally-focused, with the exception of Launch NY, which is offering both capital and mentorship across several regions. Most regions have at least one incubator where entrepreneurs can go to find resources and connections. Many regions have some type of accelerator to help launch new businesses, like StartFast in Syracuse and 43 North in Buffalo. Upstate Venture Connect hosts a regional ecosystem map and calendar so people can find information about what’s happening and where. There is still a shortage of ways to access mentorship and pre-seed and seed capital in some places, and there is a primary focus from most resources on startups with high growth potential, which make up a small fraction of the kinds of businesses that people think about starting. We have a ways to go as an ecosystem in terms of being inclusive and accessible to all kinds of entrepreneurs with different types of business models, but we’re getting closer every day. What are some recent success stories made possible by Upstate Capital’s network? ACV Auctions, a Buffalo-based company that won 43 North in 2015, just raised $93 million. Our board member, Somak Chattopadhyay from Armory Square Ventures, was an early investor and supporter of that business. That kind of raise has been virtually unheard-of in upstate New York, so that’s a big win in terms of attracting venture capital to the region. You are leading the new era of the New York State Business Plan Competition. Tell us what’s in store this year. We’re excited to introduce new tracks for the competition this year – Agtech & Food, Technology & Entertainment, NYSTAR’s Med-tech & Wellbeing and Genius NY’s Military & First Responder. These join NYSERDA’s Energy & Sustainability and Consumer Products & Services as the way we’re organizing the competitors in the Finals on April 26. These sectors align both with where we’re seeing lots of innovation across the state, and where we’re seeing students coming up with new ideas.